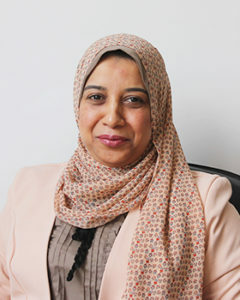 Dr. Fatma Aboelmagd is an Associate Professor of Physical Therapy for Internal Medicine and Geriatrics. She earned her bachelor’s degree in 1999, her master’s in 2005, and her PhD in 2010 in the Physical Therapy Department for Internal Medicine, Faculty of Physical Therapy of Cairo University. She worked as an Associate Professor in Medical Rehabilitation College, Qassim University, Saudi Arabia from November 2013 to June 2015. She has been promoted to an Associate Professor in the Physical Therapy Department for Internal Medicine, Faculty of Physical Therapy of Cairo University in January 2016. Dr. Aboelmagd supervised more than twenty master and PhD theses in the field of physical therapy for cardiopulmonary disorders and geriatrics. She published eight research articles in the same field in different national and international scientific journals during the last five years. She is still working on other articles which are still under review or initial preparation. She contributed to the teaching of many courses for undergraduates and postgraduates. In Cairo University, she has been a member of the Quality Assurance and Accreditation Unit, Director of the Environmental Projects Management, and Head of the Rewards Committee. Fatma A. Mohamed and Hossam El-din M. Abol-atta, Effectiveness of Endermologie Technique in Post-mastectomy Lymphedema. The Medical Journal of Cairo University, 79(2): 1-4, 2011. Nevine El-Helaly and Fatma Aboel-magd, Ventilatory Function Response to Breathing Training versus Aerobic Training in Asthmatic Children. The Egyptian Journal of Pediatric Allergy and Immunology, 10(1): 33-37, 2012. Fatma Aboel-magd and Farag A. Aly, Physiological Evidence for the Efficacy of Short Term Positive Expiratory Pressure Training in COPD Patients. Bulletin of Faculty of Physical Therapy, Cairo University, 18(1): 53-57, 2013. Fatma Aboel-magd M., Salem E.S, Serry Z.M, Tawfik M.S. and Youssef S.S., The Photobiological Effect of Low Level Laser Therapy on Serum Level of Leptin, Cholesterol and Triglycerides in Overweight and Obese Females. Arab Journal of Nuclear Science and Applications, 46 (3): 307-312, 2013. Fatma Aboel-magd M., Response of the Ventilatory Indices and Length of Hospital Stay to Inspiratory Muscle Training Following Thoracic Surgery. The Medical Journal of Cairo University, 83(2): 1-6, 2015. Fatma A. Mohamed and Heba A. Bahey El-Deen, Effect of Intermittent Pneumatic Compression Therapy on Healing of Diabetic Foot Ulcer. International Journal of Diabetes Research, 4 (4): 67-72, 2015. Samuel F.Rezkallak, Azza A.Abdelhady, Fatma A. Hamid, and Fayez F. Botros, Sonographic Response Of Diaphragmatic Excursion To Threshold Inspiratory Muscle Trainer In Elderly. The Medical Journal of Cairo University, 85 (2): 541-545, 2017. Hadeer Saber Mansour, Hala Mohamed Ezz Eldein, Fatma Aboelmagd Mohamed and Tarek Fakhr eldeen Ahmed, Efficacy Of Incentive Spirometer Training On Diaphragmatic Excursion And Quality Of Life In Hemodialysis Patients. Accepted for publication in The Medical Journal of Cairo University, 2018. Mona Abdelraouf Ghallab, Aziz Guirguis Aziz , Ashraf Aly Shamaa and Fatma Aboelmaged Mohamed, Effect Of Pulsed Electromagnetic Field On Ejection Fraction After Induced Myocardial Infarction. Accepted for publication in Bioscience Research, 2018.